Making a comeback is an art form in itself, poetry in motion if you will. Extremely difficult to pull off but incredibly satisfying to witness, the act of coming back from being down invokes emotions that are unparalleled to anything in sport. In Formula 1™, every second counts to the highest degree. An illustrious history has seen some incredible comeback drives, here we look at some of the greatest of all-time. In a rain-soaked Canadian Grand Prix, the world saw the best of 2009 World Champion Jenson Button. A marathon of a race which lasted over 4 hours saw the Brit make an incredible 6 pit stops as well as enduring a drive-through penalty to win what many onlookers consider one of the greatest races of Formula 1™ history. Having begun the race from 7th on the grid, Button was demoted to 15th place following a stop-go penalty for making up ground on a safety car. The safety car was initially brought out after Button accidentally ran teammate Lewis Hamilton into the wall on Turn 1. Further twists ensued when Button was once more involved in a collision, this time with Fernando Alonso. Another safety car ensued while Button miraculously managed to get his punctured car back to the pits. Rejoining the race in last place, Button embarked upon one of the great modern day driving displays ever seen. Sweeping the field with poise and vigour, Button chased down long-time race leader Sebastien Vettel before overtaking the German and his worn out tires on the second corner of the last lap to claim an unthinkable victory. “Ice-man” by nickname, ice cool by nature. 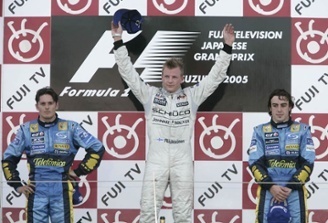 At a rain-soaked Suzuka in 2005, Kimi Raikkonen produced the best drive of his career and one of the all-time comebacks to claim a historic win. Having qualified in 17th position, chances of a podium finish were not in his thinking. A hectic start to the race which saw a collision between Juan Pablo Montoya and Jacques Villeneuve brought out the safety car. By that time, the Finn had begun to slice his way through the field. 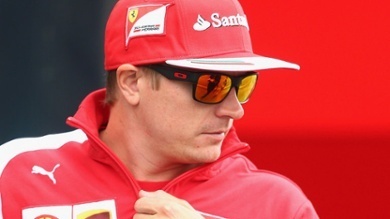 Having made a pit stop midway through the race, Raikkonen reappeared ahead of Fernando Alonso in 5thplace before passing Michael Schumacher into 4th. Benefitting from pitting early which saw him carry a heavy fuel load, both Mark Webber and Jenson Button were forced to make a stop to refuel, prompting The Iceman into second position. What Raikkonen produced next can only be described as sheer magnificence. With 9 laps remaining, he set the fastest lap each time, and despite some brilliant defensive driving from long-time race leader Giancarlo Fisichella, a determined Raikkonen pulled off a brilliant maneuver on the run down to turn 2 on the final lap to complete the greatest comeback Suzuka ever witnessed. 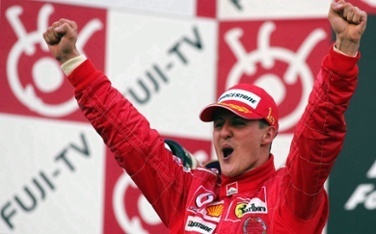 No Formula 1™ greatest ever list would be complete without mention of the best of all-time, Michael Schumacher. Though Schumi’s career was coupled with dominance, his drive in the 1995 Belgian Grand Prix proved his greatness. 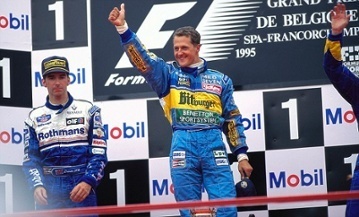 The 1995 season revolved around the rivalry of Schumacher and Damon Hill. Having both qualified down the field, Hill in 8th and Schumacher in 17th, and with the ever-changing conditions suggesting a classic was in store, what occurred as timeless. Off the blocks like a man possessed, Schumacher was up to 6th place by lap 5, just 5 seconds behind race leader David Coulthard. With the rain beginning to fall, Hill stopped for wet tires. Hill soon caught Schumacher and a game of cat and mouse began in earnest. The German’s slick tires were no match for Hill and he was overtaken on lap 26. Incredibly, the rain stopped almost instantly and Schumacher once more passed Hill, after which the Williams pitted for slicks and began chasing him again. And yet again, the heavens opened three laps later and a heavy downpour followed, forcing all drivers to pit for wet tires. The extra stop for Hill gave Schumacher a huge lead and the German brought the car home a massive 20 seconds ahead of his nearest competitor, taking the checkered flag displaying incredible driving aggression. 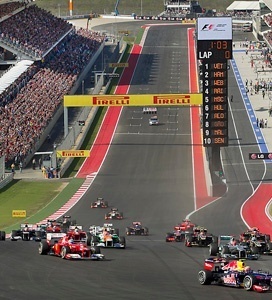 The United States Grand Prix Awaits You! One thing we have learned from the 2016 Formula 1™ season is nothing is guaranteed. With Nico Rosberg taking 5 of the opening 8 races, teammate and reigning champion Lewis Hamilton roared back with four consecutive victories before Rosberg once more proved his worth with back-to-back victories. Heading to the United States Grand Prix? 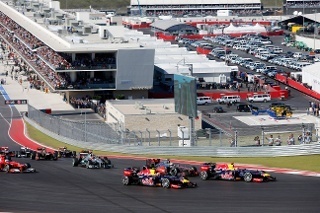 Make sure to witness the climatic end to this year’s title by making a trip to Austin for the F1™ USGP with one of our exclusive ticket packages available only through Circuit of The Americas™ program. 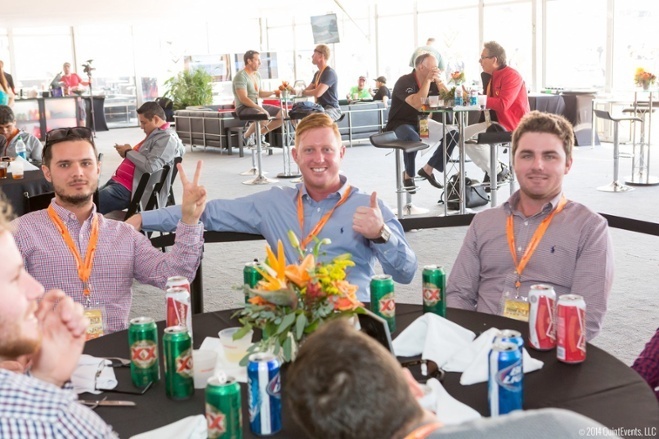 With our Legends Club Access, participate in a Q & A session with racing legend David Coulthard while enjoying an appearance by Indy 500 winner Alexander Rossi! 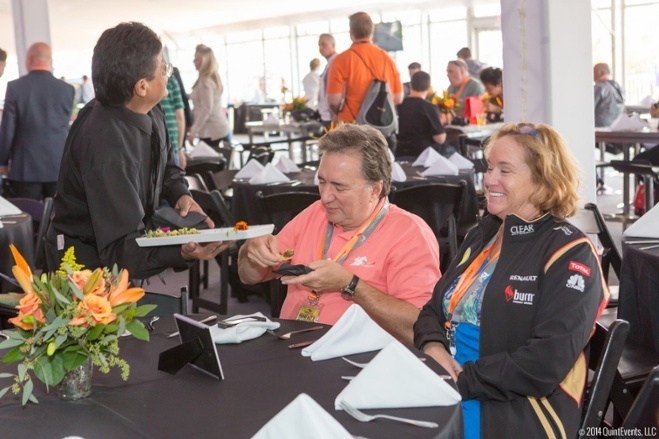 The weekend of a lifetime awaits you, witness the race from a privileged viewing positon, wine and dine with our gourmet fare and open bars. Take the pressure off yourself by adding exclusive ground transportation and hotel accommodations to make this a weekend you and your party will never forget! If testing is anything to go by, the 2016 F1™ season is going to be defined in one word: impressive. The last two weeks have been incredibly busy for the 11 teams in Formula 1™. It seems that every single team came to perform. In the few weeks that testing has taken place, we’ve seen more from every team than we have in years prior. Let’s take into account testing that took place a two years ago, where teams weren’t able to get two or three laps out of their cars with cars not running or breaking down and now we have teams like Toro Rosso running 150-160 laps a day. A DAY! This year’s testing has been amazing. Mercedes has actually completed a season’s worth of laps in just two weeks of testing, already. 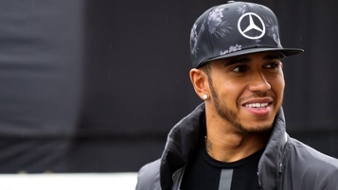 It’s only just now that Lewis Hamilton is experiencing a few liability issues with his car. With all the exciting new demonstrations of power that we’ve seen during the winter testing, let’s take a look at the 2016 season and figure out this season’s pecking order. Has anyone gained ground on Mercedes? What will Ferrari’s version of the halo head protection concept do for them? Who is leading in this year’s testing? It's almost time for the 2016 Formula One™ season to kick off in Australia, which means we are about to see the results of what the teams have been frantically working on. After a sickly-looking season in 2015, it had been all change over at Manor, most notably in the renaming of the team formerly known as Manor Marussia. The ownership has also changed, as well as engine supplier, from Ferrari to Mercedes. They clearly liked Mercedes as they selected two drivers with previous affliliation with Mercedes, in German 21-year-old Pascal Wehrlien and Indonesia’s first-ever F1 driver, Rio Haryanto. During the winter testing weeks Toro Rosso proved that it can run (to the surprise of many a team this year). Running more laps than anyone predicted gives new hopes to fans as the testing suggests that they will be right among the pack behind Mercedes and Ferrai and, with the incredibly talented teenager Verstappen, behind the wheel Toro Rosso could even top Red Bull. Toro Rosso is quietly awaiting the opportunity to race among the leaders of the pack and this could very well be the year they do. Having stepped back to become simply an engine supplier in 2011, this season marks the return of Renault as a full works team after they completed a takeover of Lotus. The French team has gone with two new drivers for their return, with Dane Kevin Magnussen, who had one season with McLaren in 2014, being joined by British newcomer Joylon Palmer. For such a young team, Red Bull Racing has seen a lot of success. However, last year the team was held back by power issues with its Renault engine. Daniel Ricciardo and Danill Kvyat unfortunately really struggled in the last few races of the 2015 championship, here’s to hoping the vast improvements they’ve shown in the winter testing is an indication of how the 2016 season will fare for them. Having succeeded Luca di Montzemolo last year, new Ferrari Chairman Sergio Marchionne made it very clear that success in Formula 1 is a top priority, and early signs in testing would suggest the Italians have the pace to challenge Mercedes. With its shortened nose, Ferrari’s engineers have fitted the car with pushrod suspension for the first time in four years. See the world’s most complex and innovative vehicles put to the test as they compete on one of the most exciting and challenging tracks in Formula 1! 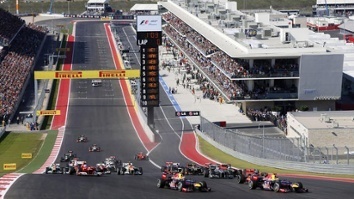 If you’re an F1™ fan, you already know that COTA is one of the most popular tracks on the calendar. It’s one of just four anti-clockwise tracks on the schedule, featuring 19 turns and a 133-foot climb into a blind left turn. 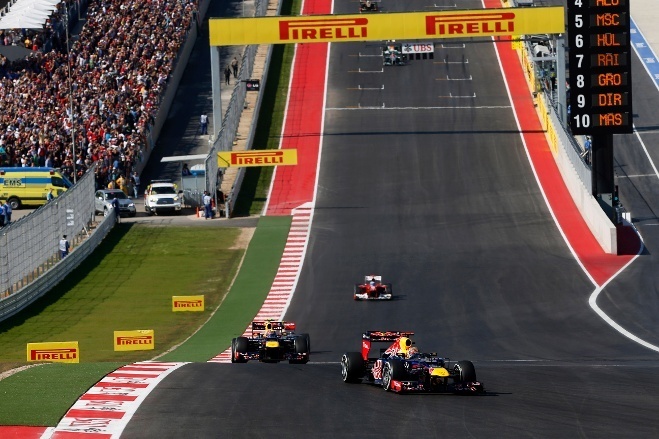 Last year’s championship was decided at Circuit of The Americas, will we see a repeat this year? Be there and find out for yourself! Mercedes has retained their winning formula as they seek to extend their dominance of Formula 1 for a third season. Winter testing in Barcelona suggested that they remain the team to beat, although their advantage may mean that a repeat of 2015 might take place and seal the championship for Lewis Hamilton once again. Rosberg finished strong in 2015 and the long-simmering rivalry between the two could boil over and ultimately hurt their chances to earn podiums. 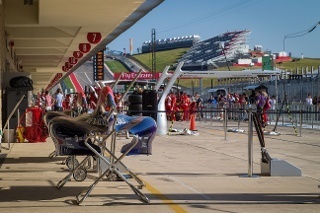 Haas’ introduction into Formula 1 has been quietly happening in the background for the past five years, so it is perhaps no surprise that the American team appears better prepared than recent newcomers to Formula 1. Their close relationship with Ferrari (engine supplier) might also have something to do with their success, as well as having two drivers with F1 experience. Romain Grosjean has 10 podiums under his belt and showed plenty of determination during his years at Lotus, while Esteban Gutierrez spent the past two seasons with Sauber. No team suffered a more chastening experience in 2015 than McLaren. One of the standard bearers of the sport and eight time constructors’ champions, the British team suffered a disastrous fall from grace, often failing to make it through the first phase of qualifying and not scoring a single point until the sixth race. It could be another painful year for McLaren and Co. with little sign of the hoped for improvement in testing. While last season saw an improvement on the miserable zero-point year of 2014, 39 percent of their 36 points came in the opening Grand Prix and they finished without a point in the final three races. With finances still a major constraint, there has been little to suggest a real improvement in 2016, and another tough season for the Swiss team could well lie in store. The past two years have been something of a resurgence from the Martini-liveried Williams outfit. Having finished third in the 2014 and 2015 Constructors’ Championhip, Frank Williams will be looking to make a leap and start challenging Ferrari, Red Bull, and of course Mercedes for the top step on the podium. After an up and down 2015, which perhaps cost him a move to Ferrari, Valtteri Bottas will be looking to step it up and show he is worthy of a seat among the real title challengers. Time to make moves Bottas! Stay tuned for Part 2 of our Australia Preview!